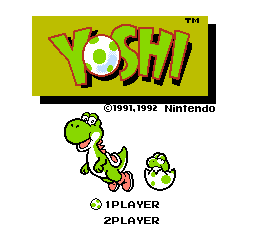 Yoshi is a puzzle game starring the titular green dinosaur, made by the people who later brought us Pokémon. The music even sounds like Pokémon. 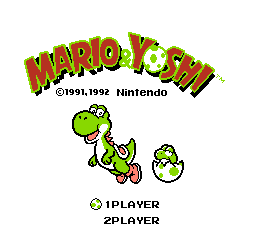 The baby Yoshi on the Japanese title screen has unused graphics for its bottom half. Presumably, they intended to show both half- and fully-hatched versions. Every region has a different title. In Japan, it's Yoshi no Tamago (Yoshi's Egg), in the US it's Yoshi, and in Europe it's Mario & Yoshi. 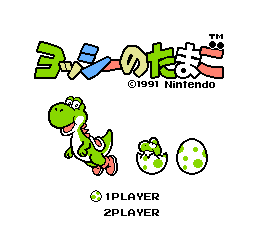 The Japanese title screen has an extra Yoshi egg and the baby Yoshi's head is at a slightly different angle. This page was last modified on 25 August 2014, at 04:36.